Clean out your spa filter basket regularly. Many hot tubs have a filter basket that catches larger particles before the water enters the actual filter. This is especially interesting when the hot tub is located outdoors. Although it is never a good idea to situate a spa right next to a tree that sheds leaves in the fall, sometimes the wind can blow leaves and other debris over the hot tub. Sometimes we even drag grass, leaves and other small particles into the spa from the bottoms of our feet. In any case, check the filter basket when checking the filter and keep it clean and unobstructed. Filter baskets are not standardized, so each manufacturer may be using a different part. For instance the Cal Spa filter basket is a top mount basket and sometimes they have a diverter plate whereas the Coleman Spa may use a snap-in filter basket which snaps into the top hole of many Coleman filter canisters. The Arctic spa filter basket requires that you rotate the top outside ring counterclockwise to unlock the basket before removing . 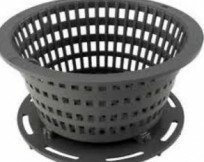 Jacuzzi employs many different filter baskets for pools and spas but also use a similar type found in Cal Spas hot tubs. If the spa filter basket is blocked, water may not flow properly into the filter area and the spa pump may even start to surge. Worse, a flow condition may be created that could damage pumps and equipment. If you need a spa filter basket replacement in Canada, contact us for a selection of discounted hot tub parts online. You can also call your dealer if you bought your hot tub locally and they may be able to help you find the replacement, but it is easier to order online. Keep your spa filter basket clean and in operating shape and relax in your hot tub this fall!